There are many people who have married for the wrong reasons or at the wrong time. Some have been able to make their marriage work, but, sadly, many do not. Take some time to think through your wedding plans and make the right decisions concerning your commitment before God. Please understand that these questions are meant for people considering marriage in the future. Maybe you have violated some of these things in your own life and are now in a marriage relationship that you regret. Don’t take these questions as condemnation. I am sympathetic to those who have less than ideal marriages. My heart breaks for you. My intention here is not to discourage you, but to encourage young people to make the right choices while they still can. You should spend as much time together as you can in non-artificial situations. Is your future mate as committed to the Lord as you? You should never consider marrying anyone who does not hold the same religious beliefs as you. The culture clash between two people coming from different families will be hard enough. It is even worse when you don’t even hold the same religious views. Of course, if you are reading this website, I assume you are a Christian seeking to serve the Lord. If not, then stop now and ask the Lord to help you take care of your relationship with Him. Make sure of your own salvation. Then get a clear salvation testimony from the one you are considering as your lifelong mate. Don’t take this lightly. The Bible has admonitions against marrying someone who is not a Christian (2 Corinthians 6:14-16). This is a very serious matter. I am amazed with how many Christian young people ignore this warning and end up in horrible relationships. That is not to say that two Christians will never have problems. However, if you ignore God’s own counsel in this matter, then how can you expect Him to bless something He has already warned you about? A marriage relationship should be one based on mutual respect. What attracts you to your future mate? Is it one or two characteristics or physical traits? Or, is your relationship based on loving the whole person? There is certainly nothing wrong with physical attractiveness. But your wonder and curiosity about the person should not end there. Love is a commitment based on a decision, whereas lust is an attraction based on feeling or emotions. Work towards loving one another. That may mean that you ultimately decide not to get married because of a clear understanding that this is not the relationship God wants you to have. That is a wonderful demonstration of true love: sacrificing what you desire for what is best for the other person. Is there anything about your future spouse that irritates you? No one is perfect. But people also don’t typically get better over time without serious help and intervention. Are there things in your future spouse that irritate you and you hope will change after you get married? If so, then you need to seriously consider putting off your wedding date until you can work through those problems. Whatever bothers you now after 1 year of dating will continue to bother you for the next 60 years of life together. And, don’t let me discourage you, but you will also probably find a multitude of other things that get under your skin the longer you live together. Whatever problems your dating relationship reveals are only those things your future mate can’t keep hidden. But over time their other irritating attributes will come out and be with you for the rest of your life. His propensity for clutter and keeping an unwashed car won’t change over time. Her compulsion to correct your grammar after every sentence you say probably won’t bother you less in 40 years than it does now. Have you spent enough time together to enter a lifetime commitment? One thing that will help you know whether the other person irritates you is to spend time with them in a healthy dating relationship. You should spend as much time together as you can in non-artificial situations. That doesn’t mean living together for 6 months to see if the relationship will work. That isn’t conducive to a healthy relationship and a lifetime commitment. What I am talking about is being together enough to know how grouchy your future spouse can get when they miss a meal. This includes working closely enough together to know how they will react under stress. Your dating time together will help show if you share similar opinions on how to handle problems. Even if you are both from the same country, you will experience a bit of the same type of culture shock that missionaries face when moving overseas. You both come from different backgrounds and experiences. The more time you can spend together before marriage, the more you will be prepared for a lifetime together. Do you honestly respect one another? Building a relationship on anything less than honest respect for one another is dangerous ground. You must respect your mate and they must respect you for who you are. That means you both need to be growing in your relationship with God and with one another. You also need to continue educating yourselves and working to be more respectable. You can’t stay stagnant in your knowledge of the world and relationship with the Lord. Are you able to talk to your friends about your future mate with awe and wonder? Does your future mate continue to surprise you with things they are capable of doing or things they know? Those types of things build respect. Are you the type of person your future spouse can respect? You should be working to bring a sense of surprise and wonder to your relationship for their sake as well. 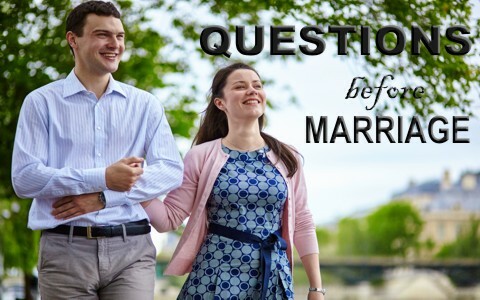 Those are questions to ask yourself about getting married. But let me ask you a question: have you prayed about this? Do you feel like you can talk to God about your desire to marry the other person? Are you able to pray together? Maybe the reason you are reading this article is because you already have doubts and are seeking affirmation in your relationship. If that is the case, then I suspect you would prefer not to ask God what His opinion of your relationship is. If you can’t pray about your relationship then now is the time to take a step back and seriously consider your relationship. Seek godly counsel from your pastor and other mature Christians in your church. Allow them to talk with you honestly about your relationship and give you direction in how to establish a wonderful marriage committed to the things of God.